Tui is on the banks of the Minho River in northern Spain, right on the border of Portugal. 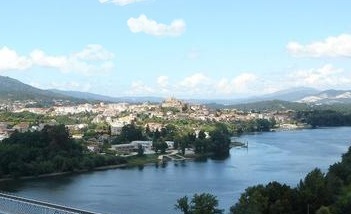 Directly opposite on the other side of the river is the town of Valenca. With both towns facing each other, they are connected by a 19th century bridge. Tui started off as a Roman settlement and was originally called ‘Tude’. It has been declared a Historic-Artistic Site with parts of the original wall that surrounded it during the 12th century still standing. In the historic quarter is the Cathedral which took over a century to complete, and was eventually consecrated in 1225 during King Alfonso’s reign. The portico is a stunning piece of masonry, and boggles the mind as to how many man hours it must have taken to create it. The Cathedral was more of a castle cathedral with battlements and fortifications, and if you walk along the battlements you will get a better perspective of the sheer scale of its size. However, the best view of the cathedral in its entirety is from the riverbank below. Inside the Cathedral is a small museum, as well as a viewing point that has incredible views across to Valenca and Portugal. Wandering through the narrow streets, you will come to the main square lined with attractive Galician style buildings and outdoor cafes. There is an old court house which was built into the slope and leads down to the river which is worth a look, as well as the Bishop’s Palace. Tui also has a number of interesting churches, such as the Church of St Francis, once part of a Franciscan convent during the early 1700’s. The Church of the Cloistered Nuns was part of the community of the Saint Claire Order in 1508. Only a short walk from the Cathedral is the 15th century Santo Domingo Church and convent set in a small park. Most of its design is Gothic with Galician Baroque additions that came later, but sadly, little of the convent remains. If you wish to explore beyond Tui, the Aloia Mountain and Nature Reserve are within easy reach. Alternatively, there is the prehistoric settlement on Mount Santa Tecla which is farther down river. Being so close to Valcena, it would be a shame not to cross over to Portugal to have a look. However, if you are after beautiful beaches then you must head for the Isles de Cies. Ferries from Vigo or Baiona will take you out there, and the beaches are just short of a tropical paradise. It is important to remember though, the water is not as warm as the tropics! During Easter there are always festivals going on, which may have an influence as to when you wish to come for they add a great deal of atmosphere and fun to the proceedings. There is also an International canoeing descent on the river during August. If you are looking for accommodation, the Parador Tui (Hotel San Telmo) would be ideal. It is a typical Galician manor house which has been converted into a four star hotel, and has an excellent restaurant serving International and local dishes.